Make your leftover chicken into the ultimate comfort food with a few small additions. This pie can be frozen, perfect for when you need comfort food in a hurry. Check the tips section for freezing instructions. For the sauce, melt the butter in a heavy-bottomed saucepan, add the flour and cook slowly over a low heat for 3 minutes, or until the mixture smells toasty. Pour in the chicken stock, turn up the heat and stir constantly until simmering. Add the cream and gently simmer until the sauce until it has a syrupy consistency. Add the lemon juice and tarragon. Turn off the heat. In another pan, gently fry the chicken, peppers and mushrooms in a knob of butter for 5 minutes, then add to the sauce. 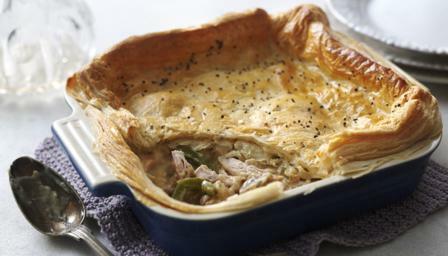 Butter an ovenproof dish large enough to hold the chicken pie mixture with room to spare. Add the chicken mixture to the dish. Roll out the pastry on a floured work surface, to a thickness of about ¼in/1cm. Place the pastry over the filling and carefully trim the edges. Use the trimmings to make cut-out shapes to decorate the surface of the pie. Cut a couple of air holes with a knife to allow the steam to escape. Brush the pastry with the beaten egg. Bake the pie in the preheated oven for about 25-35 minutes. The top should be nicely browned and the filling piping hot. Remove, allow to cool slightly and serve.